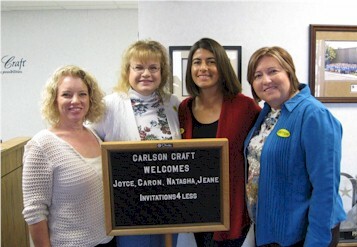 I was recently lucky to be one of four members of the Invitations4Less.com team to have the pleasure of touring the leading wholesale social printer in the U.S., Carlson Craft in Mankato, MN. It was an awe-inspiring day and gave us great insight into the procedures and future of printing of such products as Wedding Invitations, Bar & Bat Mitzvah Invitations, Graduation Announcements, Quince Años Invitations, Holiday Cards and Birth Announcements..
To see how this giant in the printing industry operates like clock-work to get your invitation order from concept to finished product was indeed a privilege, but to meet the faces behind the creativity and productivity was the greatest pleasure of our visit that day. Every step of the way, a department head was at the ready, proud to show off their role in the process. It’s amazing to realize the work that goes into processing over a thousand orders per day. And to meet in person our customer service representative, Tiffany, who assists us on a daily basis with moving things along smoothly was a real treat! Although it was an excellent opportunity for us to understand the process of fulfilling your orders efficiently, our greatest excitement came from previewing the future. We were able to stand over the shoulder of Kim in Marketing as she flipped through the pages of a forthcoming album to show us what’s next in the fashion of wedding invitations, witness the assembly of albums that will ship to dealers beginning in January and speak with the president of the company, Barb Kaus, about ways to strengthen our relationship with Carlson Craft. Overall a great day with memories to last! A nice welcome as we entered the front door. 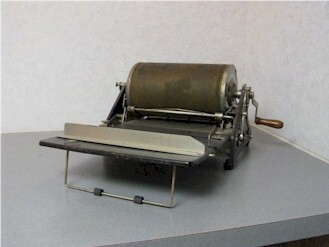 An original printing press is on display at Carlson Craft. 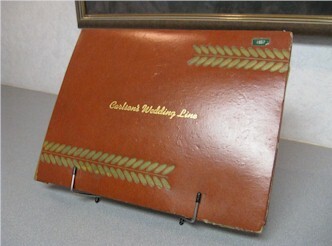 A Carlson Craft Wedding Invitations sample album from 1957. To paraphrase my dad, "You can have any color you want, as long as it's white". And a sneak preview of what's to come. 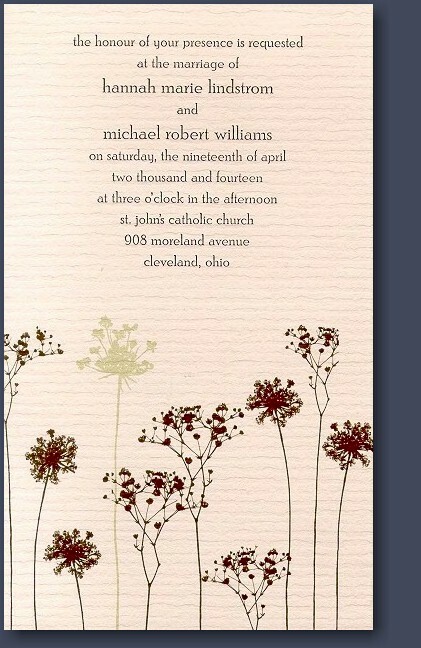 We all "oohed and ahhed" over this forthcoming Letterpress Wedding Invitation on textured ivory stock with mocha and sage wildflowers. Can't wait to see the rest of the album in person! Joyce Buczek was the founder and original owner of Invitations4Less.com in 1999. She continues working with Invitations4Less.com as a consultant and guest blogger. In her spare time, Joyce enjoys traveling, cooking and spending time with her family, including 2 spoiled cats.